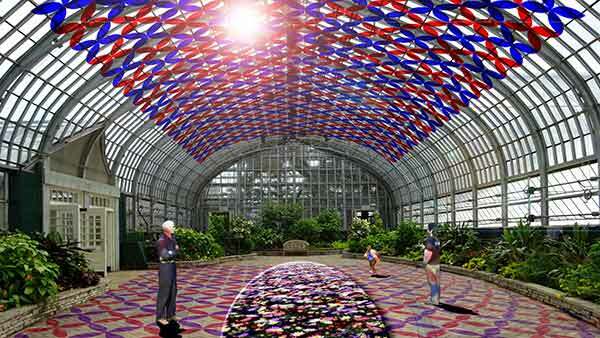 CHICAGO (WLS) -- Mayor Rahm Emanuel and the Chicago Park District will announce Wednesday that the Garfield Park Conservatory will host a series of immersive light and reactive sculpture installations by Chicago's Luftwerk Studio. The installation, called solarise, was created specifically for the conservatory and will highlight its architecture and plant collection. Solar panels will power the LED lighting in the sculpture. solarise will be be on display from Sept. 23, 2015 to Sept. 22, 2016 - from autumnal equinox to autumnal equinox.